Well, it's time yet again for another Valentine craft! 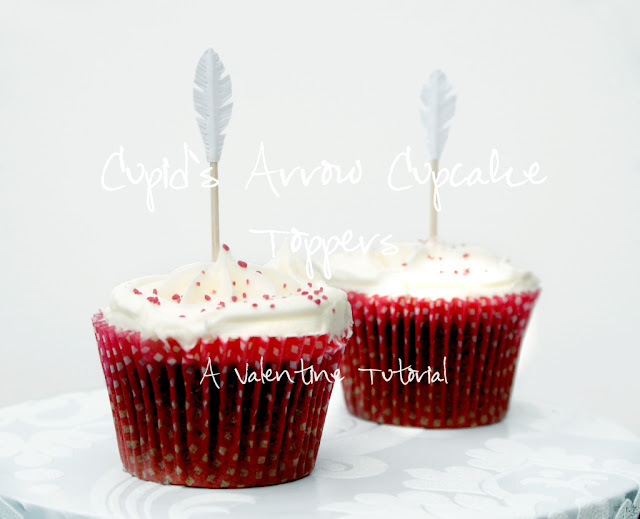 This time I'm showing you how to make full cupid's arrow cupcake toppers, like the ones in my shop! They're great fun and they look so cute, too. You could have them standing alone on a cupcake, or get a bundle and pierce a bigger cake with a volley of them! Or be -really- creative and make a Valentine hedgehog cake! 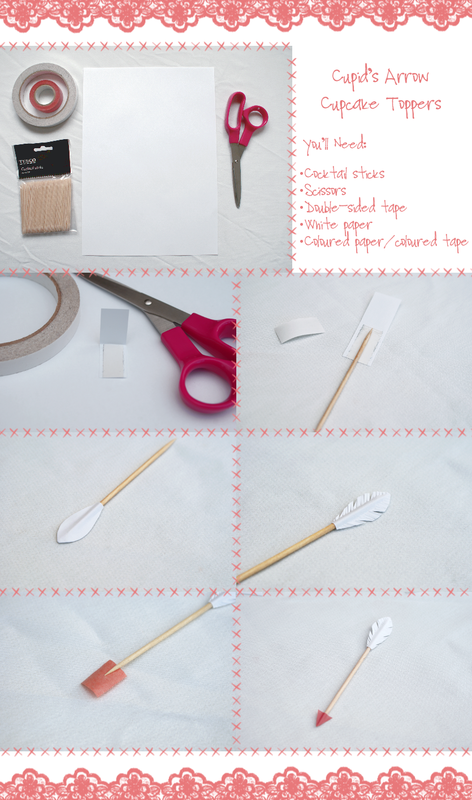 They're super easy, and you should have most of the necessary materials, except perhaps double-sided tape, but that can be substituted for glue if need be. So let's crack on! 1. Cut a piece of double-sided tape about an inch long, then stick it to the bottom corner of the paper, leaving a small gap to one side. Cut a strip of paper out, in the same direction as the tape and leaving the same space on the other side, but cut the length of paper at least twice as long as the tape. 2. Fold the paper in half and trim the excess from the end, so that the strip of paper, in half, is the same lengh as the tape. Then, remove the backing and place the toothpick down the middle. Make sure that the point of the stick as at the top of the tape, then fold the paper over and stick it to the rest of the tape. 4. Now make lots of little cuts pointing at a downward angle along the fletching, and once you've done that, cut some notches out to make it look a little more worn - or cut none to keep the prestine look. 5. Next, take some coloured paper and a piece of double sided tape and cut a smaller strip. I used coloured tape. Remove the backing from your double sided tape and place the end of the tooth pick in the tape, much the same way as you did for the fletching. Then fold it up and stick it down, the same as before, then take your scissors and cut the two bottom corners away to make a triangle. 6. Grab a cake and fire it in. Or, rather, just push it in. Unless you have a little tiny bow, in which case, I want one too. And you're done! I hope you enjoyed this, and I also hope to see you in two days for another tutorial!